Across Mt Hengill and around Lake Thingvallavatn. This is a fun ride around Lake Thingvallavatn, the area of the Mid-Atlantic Ridge and the ancient site of Iceland's parliament. Icelanders have been riding to Thingvallavatn for over 1,000 years. You’ll have an early arrival at Keflavik International Airport and use your tickets for the Flybus shuttle to the BSI bus terminal in Reykjavik. Luggage can be left here, you can get some breakfast, and it will be very convenient to explore a bit of Iceland’s capital city. Around 5:30 PM, your outfitter will pick you up at BSI and take you to their farm in Hveragerdi, about 45 minutes outside of the capital. The tour group meets over dinner and is given details of the tour ahead. Horses North clients are upgraded to a night in the comfortable Hotel Eldhestar. From Hveragerdi the tour starts along the old route to Hellisheidi, and then to volcano Hengill along the Kristnitökuhraun lava field. This lava came from the eruption of Hengill in the year 1000, the same year Iceland officially became Christian. The old folktales say that the eruption was the revenge of the old gods Thór, Ódinn and Freyr. You’ll ride on the track between lava and hills ("milli hrauns og hlidar"), down to Kolvidarhóll, which has been a rest stop for travelers for hundreds of years. The horses will stay here while riders return to the hotel for dinner and a good nights sleep! 21 km, 4 hrs. Morning finds the riders continuing north below the Húsmúli and Hengill mountains, and then you’ll dismount and lead the horses through the narrow cleft to Marardalur (Valley of Horses). Riding through Dyrfjöll (Door mountains), and reaching the mountaintop, the vista opens up to reveal Lake Thingvallavatn. The track continues along the lake past Hestvik to the farm Heidarbær. Further on you’ll be able to see the old Althing , which was Iceland’s Parliament for hundreds of years. From here, it is not far to Skógarhólar where you’ll spend the night. Iceland's big national horse competition was held at Skógarhólar until 1978. 38 km, 6-7 hrs. You’ll cross Thingvellir National Park, today, one of Iceland’s most important places. From Gjábakki there is an exceptional view over the park, including the largest lake in Iceland, Lake Thingvallavatn. This is also the area where the North American and European crustal plates meet. After riding across the Lyngdalsheidi Moors you’ll pay a short visit to the area’s historic caves. From Laugardalsvöllum it's back to Lyngdals-heidi Moor, finishing the day's ride at the cottage Kringlumýri. 30 km, 6-7 hrs. From Kringlumýri the mornings rides starts along soft riding paths called Drift, and there is another nice view over Lake Thingvallavatn. You’ll ride past one of Iceland’s’ first water power stations at Ljósafossvirkjun built in 1937. Your horses will take you easily along the south side of the lake to the farm Villingarvatn, where they will spend the night. Riders will return to continue by bus to Eldhestar's farm, Vellir. 25 km, 5-6 hrs. Today’s ride starts up the mountains with another beautiful view over Lake Thingvallavatn and then along two volcanic crater lakes, Kattartjarnir. There are many hot springs in the next green area which is soon followed a steep lava path leading down into Reykjadalur Valley, whose hot springs invite you for a dip! There is a magnificent view over the sea and the Westmann Islands as you ride back down into Hveragerdi. 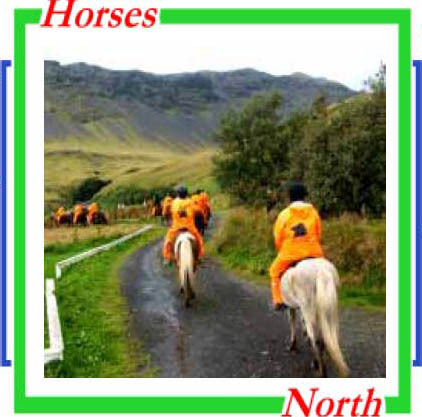 You’ll say good-bye to the horses at Vellir and then go back to Reykjavik where an upgrade to hotel accommodations await Horses North clients. Often riders all go out to one of Reykjavik's many good restaurants for a last dinner together, (but it’s not included in the price!). 20 km, 4 -5 hrs. The tour officially ends the next morning after breakfast. For those returning home, the Flybus will take riders back to the Keflavik International Airport. Others can start their further explorations of Iceland, and we’ll be happy to help plan those travels. *Price includes round trip airfare,including fuel surcharge and departure taxes fromfromBoston, New York, and Washington Dulles International Airport (ask about prices from Denver, Minneapolis, Anchorage, Seattle, and Toronto). Also included are all airport transfers, hotel accommodations with private bath, tv, internet connection and breakfast for pre- and post-ride nights, sleeping bag accommodations during the ride in mountain huts and guest houses with shared facilities, all meals during the ride, as well as safety helmets and rain gear. *Not included in the price are travel insurance, breakfast and lunch on your arrival day, dinner on your last riding day back in Reykjavik, lunch and dinner on the day of departure and the cost of any additional travel. Accommodations on the Around the Lake Tour are traditionally Icelandic, with a special upgrade for the first and last nights - you’ll be at the Hotel Eldhestar and a comfortable Reykjavik hotel on those nights. During the ride, you'll need to bring a sleeping bag; the outfitter will provide a mattress. The farmhouses, mountain huts and cabins where you'll sleep are warm and clean. Typically there are several beds per room. In huts there may be one big sleeping room. Most will have shared bathroom facilities. We can arrange your travel dates to give you any extra time you might want, either before or after a riding tour, so that you can explore Iceland. We can even extend your trip to mainland Europe easily and inexpensively.Please note that travel dates to and from Iceland are flexible and a little bit of extra travel is the perfect way to end a great riding tour. At Horses North, we've traveled all over Iceland, and can advise and book everything you will need to see more of this spectacular island. From rental cars and restaurants to guest houses and hotels, we can help you find good maps, good roads and good sunsets.